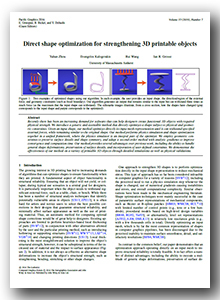 effectiveness of our method on a variety of printable 3D objects through detailed simulations as well as physical validations. The following document contains analytic gradients and Hessians used in our optimization. The following archive contains the source code and experimental data of our method. Please read the readme file in the code folder of the archive for more details. We thank the reviewers for their comments. This work was supported by NSF grants CHS-1422441, CHS-1617333, and IIS-1423082.